As the leading premium food website in the UK, we work closely with a select group of food brands. We help these brands understand foodies, tailor their messages to help engage them and deliver results. Many of our partners have worked with us year after year and consider us a key element of their go-to market strategy. Great British Chefs is a unique business that leverages its deep insight into foodies to help brand partners understand and engage their target audience. We provide our partners with actionable insight into their categories and help them optimise their story so that it resonates with foodies. We provide a full-service marketing solution with authority and credibility that has been proven to deliver strong results. I was thrilled when Great British Chefs was created. It’s a brilliant online portal into the world of professional chefs which interacts with other chefs and home cooks, beautifully. Recipes, tips, well written articles and up to date restaurant information all on one site. I have been involved with Great British Chefs since the beginning and have watched the apps and website and now book come to fruition. It goes without saying it is a go to index of some of the best chefs' recipes that are easily replicable by the confident home cook. I am very pleased to have been associated with Great British Chefs for a number of years. Their website is incredibly informative, easy to access and above all else engaging, with a wide range of interests for all food lovers. I have been sharing ideas both professionally and for the home with Great British Chefs for a number of years, its a wonderful site for inspiration. I've been working with Great British Chefs since they started in 2011, when I was one of the first chefs to be involved. They have supported me greatly over the years - publishing my recipes and collaborating with me on various projects, and I look forward to continuing to work with them in the future. Great British Chefs is a numbers-driven business that believes in the power of data. We have deep insight into our users, who have answered over 900,000 questions for us in the last 12 months. We measure everything we do and this approach has helped us grow our social channels and website traffic rapidly. We apply the same data-driven approach to the work we do with clients. The Great British Chefs website receives 15 million visits a year and is growing at 35% year-on-year. The traffic is predominantly organic (70+%) and comes from foodies who are searching for recipes and food-related content. The visitors to our website spend longer on our site and view more pages than any other UK food site (source: Similarweb.com) because it is faster, functionally superior and filled with beautiful, engaging content. Over the years, Great British Chefs has built a loyal community of passionate foodies. Our users love food and are always keen to be part of the conversation. They comment, like and share our posts, acting as advocates and influencers to the rest of the UK’s foodie community. Working with with Barilla since 2015, we have helped establish them as the pasta of choice for Britain’s foodies. They feature across every piece of pasta content on our website. Since 2014, we have partnered with Peter’s Yard to put them at the heart of the UK’s obsession with artisanal cheese. 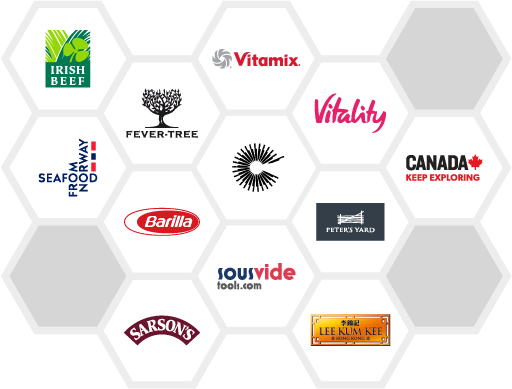 They are the founding sponsor of our Great British Cheese Awards, an annual celebration of the best and brightest in British cheesemaking today. Since 2015, we have worked with Explore Canada to inspire foodies to engage with Canada’s unique food and travel story. The campaign has delivered fantastic results, with a significant increase in search volumes and consideration as a holiday destination. Great British Chefs and Sous Vide Tools have worked together since 2012 to inspire foodies to cook sous vide. Today, almost 9% of our audience own sous vide.